Junior account executive acts as a vital link between the customer and the Chief account executive. The job description of these junior account executives entails reporting to the chief account executive and deputizing the senior account executive as and when required. The other primary duties include attending client meeting, preparing client reports, developing workable strategies, developing helpful plans to target prospective customers and retaining existing customers, managing accounts of clients, reporting on report status, communicating price and product details, coordinating with account executive and account managers for creating customized sales plans and promoting new products. A path to this line of operation becomes simple if the candidates are able to depict the following skills in the Junior Account Executive Resume – experience in CRM software, understanding of sales principles and awareness of the relevant technological applications. A degree in the field of Business management, statistics, psychology, marketing, operational research, media studies, advertising or communications proves to aid job performance for the post of junior account executive. 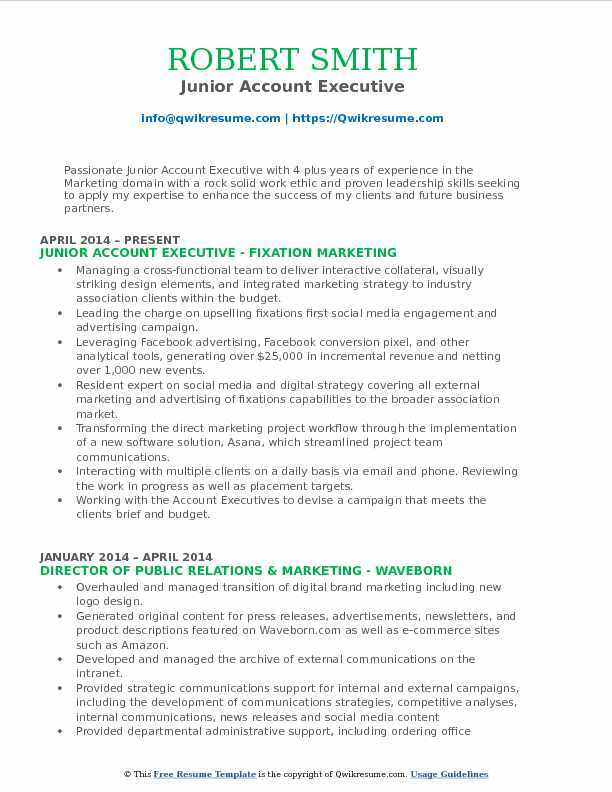 Objective : Outgoing and creative Junior Account Executive with two plus years of experience in the Marketing domain offering expertise in high visibility, public, media covered promotions as well as complex event planning, local publicity, and social media. Liaising with clients and responsible for successful management and execution of studio directives and events. Recognized by the company & clients for developing innovative ways to promote films using various marketing tactics. Social media - curating content and managing NY allied IM Agency Facebook, Instagram, and Twitter social accounts. Managed over last year- 75+ screenings, 15 red-carpets, 10 press events. Managing recruitment, interviewing and hiring for office intern program and college ambassador program. Managing the process of post-event recaps, progress reports, and critiqued execution of events for the general client. Managing overall campaign/event budgets and timetables and accountable for final invoice reconciliation. Overseeing and managing all screening/event staff and studio representatives including training and scheduling. Collaborating with the Event Manager to ensure that events are adequately staffed and supervising the event staff. Maintaining and managing the accurate event attendee lists and ensuring lists are updated on a timely basis. Collaborating with the Event Manager and Accounts Payable department to review vendor invoices for accuracy, obtaining necessary approvals, and processing for timely payment either via check or corporate credit card. Headline : A self-motivated Junior Account Executive with 6+ years experience in Finance, administration, customer service, bookkeeping, tax preparation and general office management. Well-versed in oral, written communication, multitasking and task completion. Proficient in executive support; handling appointments, messaging and writing correspondence. Strong background in QuickBooks online, MS Word, Excel, PowerPoint and Outlook. Adept at learning new technologies. 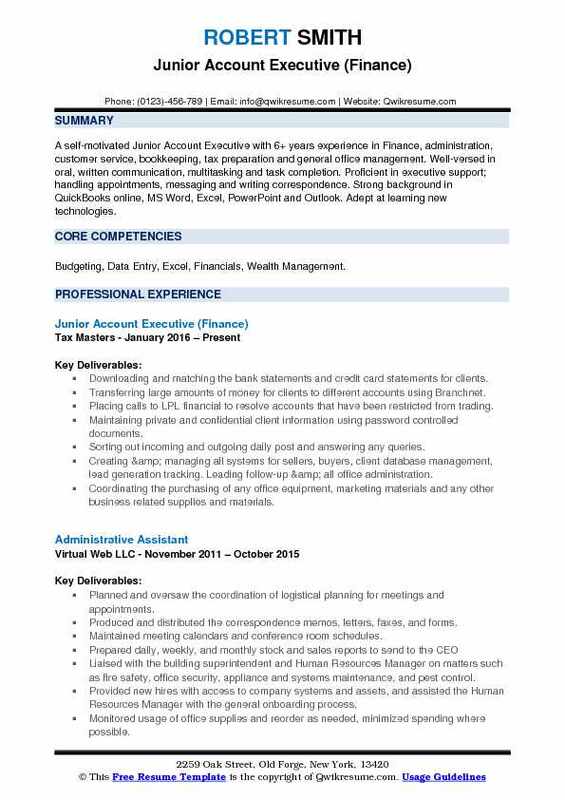 Skills : Budgeting, Data Entry, Excel, Financials, Wealth Management. Downloading and matching the bank statements and credit card statements for clients. Transferring large amounts of money for clients to different accounts using Branchnet. Placing calls to LPL financial to resolve accounts that have been restricted from trading. Maintaining private and confidential client information using password controlled documents. Creating & managing all systems for sellers, buyers, client database management, lead generation tracking. Leading follow-up & all office administration. Coordinating the purchasing of any office equipment, marketing materials and any other business related supplies and materials. Tracking and coordinating all leads from websites, social media, and other online sources. Inputting all listing information into MLS and marketing websites and update as needed. Headline : Freelance Junior Account Executive with field and marketing experience in the tech industry and retail analytics. A passionate and creative worker with strong presentation and data analysis skills. Proven ability to adapt to new environments with great communication skills. Fluent in English and Spanish; intermediate Portuguese. 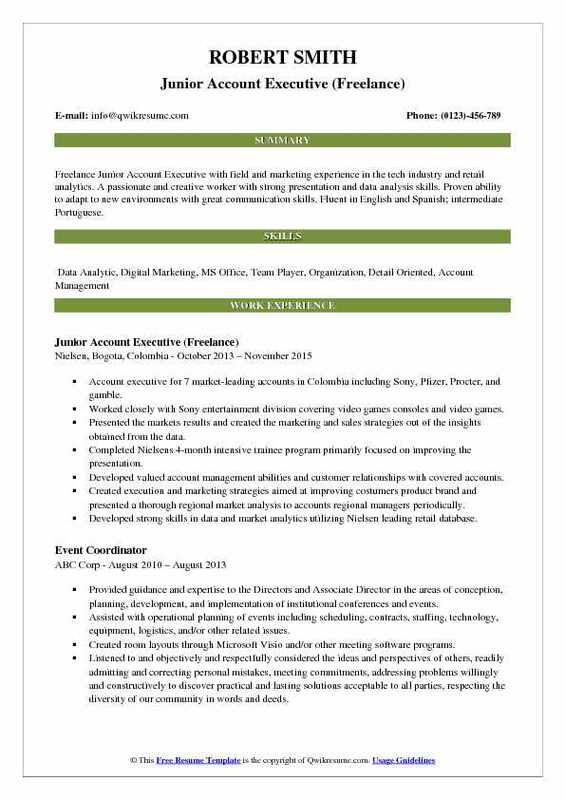 Account executive for 7 market-leading accounts in Colombia including Sony, Pfizer, Procter, and gamble. Worked closely with Sony entertainment division covering video games consoles and video games. Presented the markets results and created the marketing and sales strategies out of the insights obtained from the data. Completed Nielsens 4-month intensive trainee program primarily focused on improving the presentation. Developed valued account management abilities and customer relationships with covered accounts. Created execution and marketing strategies aimed at improving costumers product brand and presented a thorough regional market analysis to accounts regional managers periodically. Developed strong skills in data and market analytics utilizing Nielsen leading retail database. 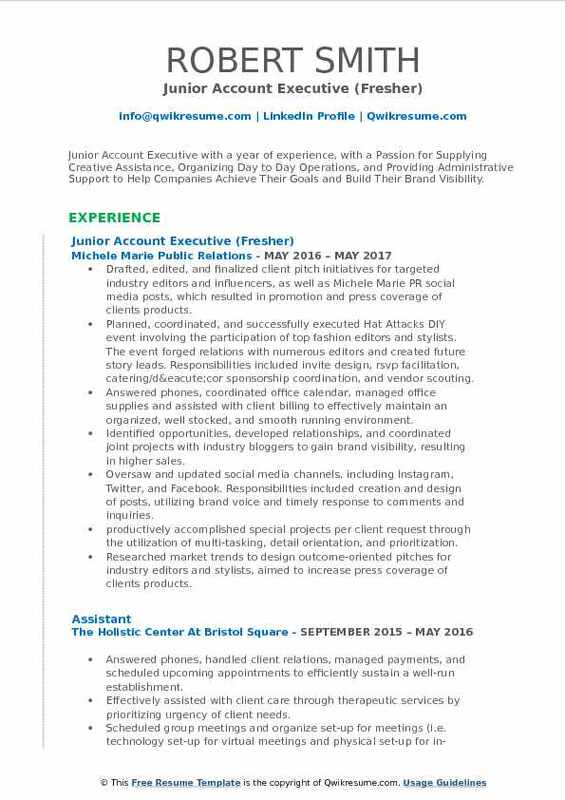 Objective : Junior Account Executive with a year of experience, with a Passion for Supplying Creative Assistance, Organizing Day to Day Operations, and Providing Administrative Support to Help Companies Achieve Their Goals and Build Their Brand Visibility. Drafted, edited, and finalized client pitch initiatives for targeted industry editors and influencers, as well as Michele Marie PR social media posts, which resulted in promotion and press coverage of clients products. Planned, coordinated, and successfully executed Hat Attacks DIY event involving the participation of top fashion editors and stylists. The event forged relations with numerous editors and created future story leads. Responsibilities included invite design, rsvp facilitation, catering/décor sponsorship coordination, and vendor scouting. Answered phones, coordinated office calendar, managed office supplies and assisted with client billing to effectively maintain an organized, well stocked, and smooth running environment. Identified opportunities, developed relationships, and coordinated joint projects with industry bloggers to gain brand visibility, resulting in higher sales. Oversaw and updated social media channels, including Instagram, Twitter, and Facebook. Responsibilities included creation and design of posts, utilizing brand voice and timely response to comments and inquiries. productively accomplished special projects per client request through the utilization of multi-tasking, detail orientation, and prioritization. Researched market trends to design outcome-oriented pitches for industry editors and stylists, aimed to increase press coverage of clients products. Tracked and clipped resulting press coverage of clients product to gauge brand visibility and keep clients up-to-date. Designed and formatted bi-weekly client reports, which included through Microsoft PowerPoint, Word, and Excel, facilitating strong client relations. Summary : Results-oriented, Junior Account Executive with 11 years of experience in developing, implementing and managing media/public relations strategies, content development and activities. Superb communication skills with talent in developing innovative public relations and marketing strategies. Initiating over $720,000 in aggregate revenue by conducting secondary sales coverage for corporate clients. Responsible for initial stages of the sales cycle: account research, interest development, and needs analysis. Maintaining rhythm of 600 activities per week (calls, conversations, emails, demos). Converting support calls into orders and maximizing the order size through cross-selling and up-selling. Educating the business decision-makers on image compression and recognition and document workflow solutions. Obtaining, maintaining and articulating a comprehensive understanding of Cvision offering to prospect issues. Working with the Senior Account Executives to develop proposals, provide deal evaluation, and sales negotiations. Assisting with pipeline management and reporting, to better understand coverage, velocity, and win-rate. Researching, identifying, tracking and building the relationships with appropriate social media bloggers/influencers to ensure excellent client exposure. Analyzing the market conditions, competitor products, and pricing to a better-articulated value proposition. Summary : A determined Junior Account Executive with 7 years of experience in the Retail domain who is organized and detail-oriented with the abilities to work in fast-paced environments. 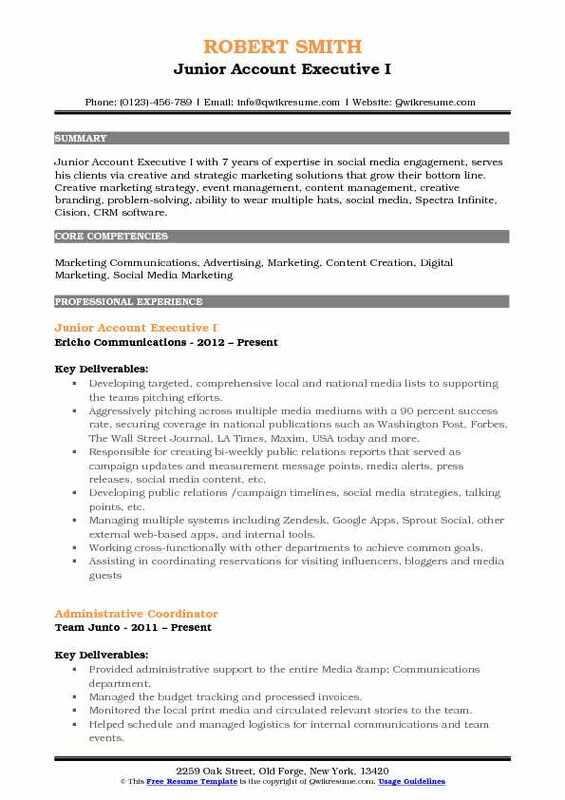 Proven skills in communications, research, and digital media, as well as four years of management experience in previous companies. Able to manage multiple projects and consistently meet deadlines. Effectively accomplishes objectives with creativity, enthusiasm, and responsibility. 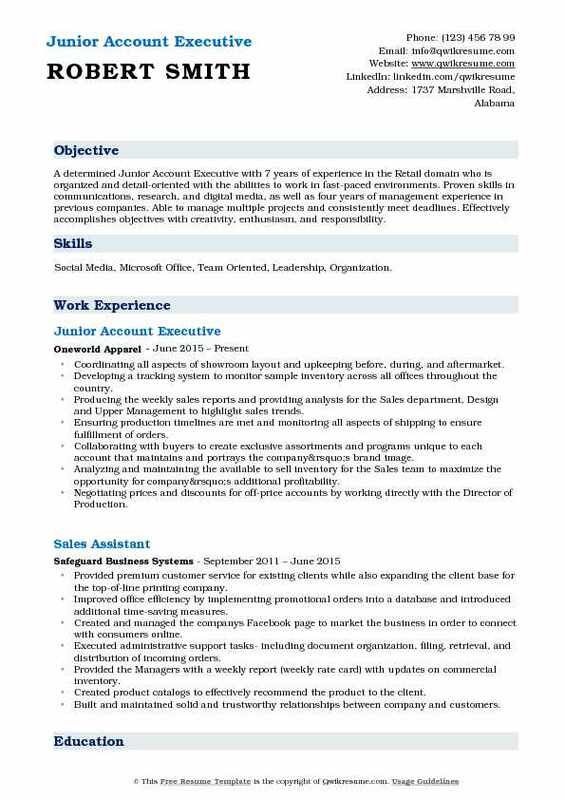 Skills : Social Media, Microsoft Office, Team Oriented, Leadership, Organization. Coordinating all aspects of showroom layout and upkeeping before, during, and aftermarket. Developing a tracking system to monitor sample inventory across all offices throughout the country. Producing the weekly sales reports and providing analysis for the Sales department, Design and Upper Management to highlight sales trends. Ensuring production timelines are met and monitoring all aspects of shipping to ensure fulfillment of orders. Collaborating with buyers to create exclusive assortments and programs unique to each account that maintains and portrays the company’s brand image. Analyzing and maintaining the available to sell inventory for the Sales team to maximize the opportunity for company’s additional profitability. Negotiating prices and discounts for off-price accounts by working directly with the Director of Production. Promoted within 5 months of employment and given more responsibility working closely with new business development. Responsible for directing comprehensive multilingual marketing and advertising projects to support clients expanding into international markets. 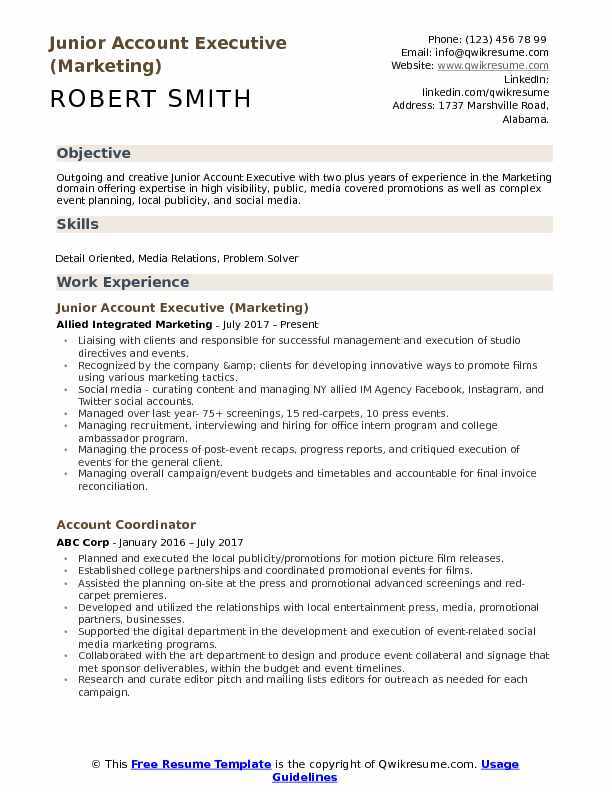 Objective : Passionate Junior Account Executive with 4 plus years of experience in the Marketing domain with a rock solid work ethic and proven leadership skills seeking to apply my expertise to enhance the success of my clients and future business partners. Managing a cross-functional team to deliver interactive collateral, visually striking design elements, and integrated marketing strategy to industry association clients within the budget. Leading the charge on upselling fixations first social media engagement and advertising campaign. Leveraging Facebook advertising, Facebook conversion pixel, and other analytical tools, generating over $25,000 in incremental revenue and netting over 1,000 new events. Resident expert on social media and digital strategy covering all external marketing and advertising of fixations capabilities to the broader association market. Transforming the direct marketing project workflow through the implementation of a new software solution, Asana, which streamlined project team communications. Interacting with multiple clients on a daily basis via email and phone. Reviewing the work in progress as well as placement targets. Working with the Account Executives to devise a campaign that meets the clients brief and budget. Responsible for growing sales funnel through traditional prospecting methods and utilizing new methods to reach new clients. Responsible for setting sales calls with potential prospects, setting agendas, ensuring prospects are guided through the sales process. Headline : Junior Account Executive I with 7 years of expertise in social media engagement, serves his clients via creative and strategic marketing solutions that grow their bottom line. Creative marketing strategy, event management, content management, creative branding, problem-solving, ability to wear multiple hats, social media, Spectra Infinite, Cision, CRM software. Developing targeted, comprehensive local and national media lists to supporting the teams pitching efforts. Aggressively pitching across multiple media mediums with a 90 percent success rate, securing coverage in national publications such as Washington Post, Forbes, The Wall Street Journal, LA Times, Maxim, USA today and more. Responsible for creating bi-weekly public relations reports that served as campaign updates and measurement message points, media alerts, press releases, social media content, etc. Developing public relations /campaign timelines, social media strategies, talking points, etc. Managing multiple systems including Zendesk, Google Apps, Sprout Social, other external web-based apps, and internal tools. Working cross-functionally with other departments to achieve common goals. 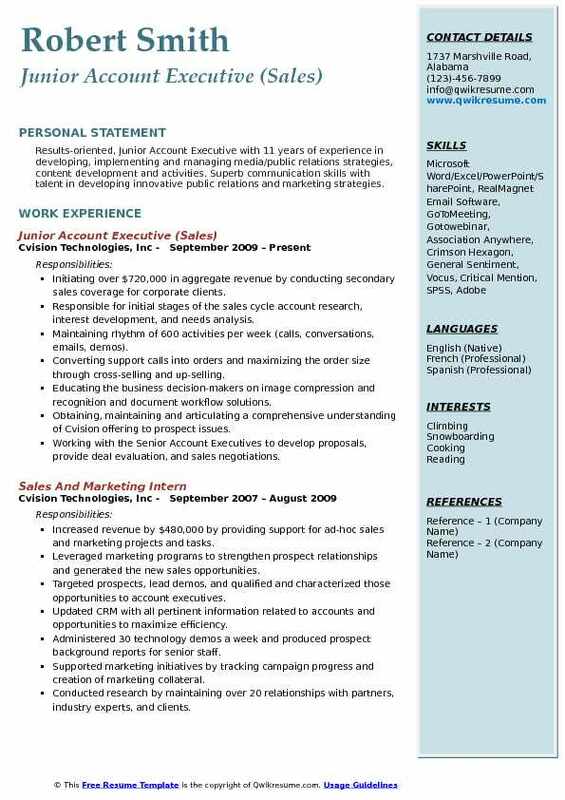 Objective : Junior Account Executive with 3 plus years of experience in the Manufacturing domain is seeking to obtain a full time employment in an environment that will allow me to submerge my skills and experiences dealing with sales, account management, and business development and utilize them toward a Sales Representative role in the Pharmaceutical Industry. 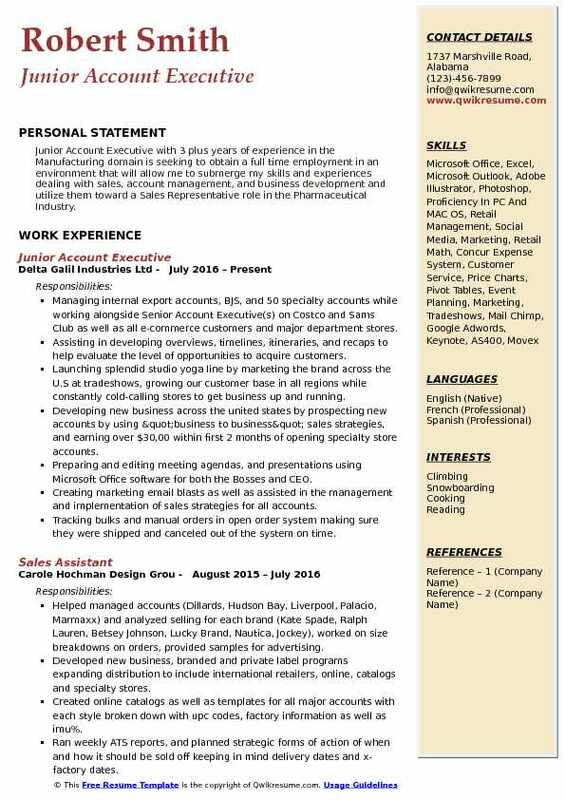 Managing internal export accounts, BJS, and 50 specialty accounts while working alongside Senior Account Executive(s) on Costco and Sams Club as well as all e-commerce customers and major department stores. Assisting in developing overviews, timelines, itineraries, and recaps to help evaluate the level of opportunities to acquire customers. Launching splendid studio yoga line by marketing the brand across the U.S at tradeshows, growing our customer base in all regions while constantly cold-calling stores to get business up and running. Developing new business across the united states by prospecting new accounts by using "business to business" sales strategies, and earning over $30,00 within first 2 months of opening specialty store accounts. Preparing and editing meeting agendas, and presentations using Microsoft Office software for both the Bosses and CEO. Creating marketing email blasts as well as assisted in the management and implementation of sales strategies for all accounts. Tracking bulks and manual orders in open order system making sure they were shipped and canceled out of the system on time. 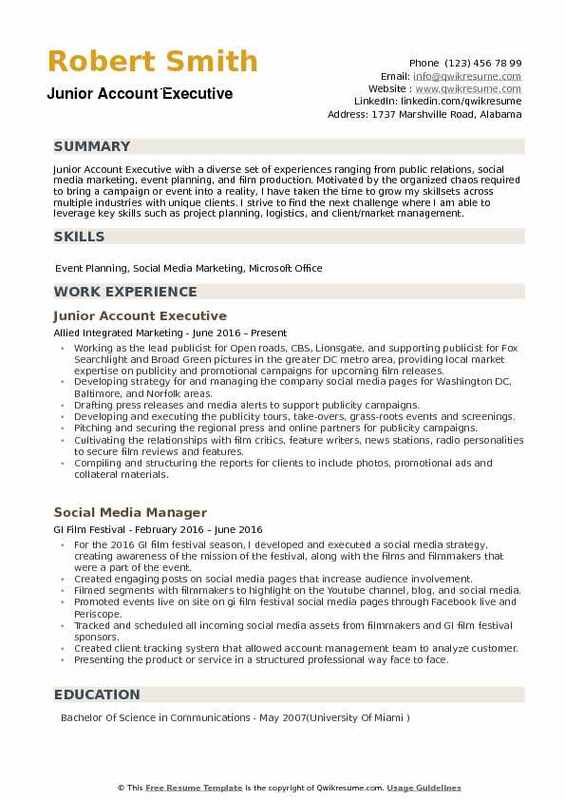 Objective : Junior Account Executive with a diverse set of experiences ranging from public relations, social media marketing, event planning, and film production. Motivated by the organized chaos required to bring a campaign or event into a reality, I have taken the time to grow my skillsets across multiple industries with unique clients. I strive to find the next challenge where I am able to leverage key skills such as project planning, logistics, and client/market management. Working as the lead publicist for Open roads, CBS, Lionsgate, and supporting publicist for Fox Searchlight and Broad Green pictures in the greater DC metro area, providing local market expertise on publicity and promotional campaigns for upcoming film releases. Developing strategy for and managing the company social media pages for Washington DC, Baltimore, and Norfolk areas. Drafting press releases and media alerts to support publicity campaigns. Developing and executing the publicity tours, take-overs, grass-roots events and screenings. Pitching and securing the regional press and online partners for publicity campaigns. Cultivating the relationships with film critics, feature writers, news stations, radio personalities to secure film reviews and features. Compiling and structuring the reports for clients to include photos, promotional ads and collateral materials.